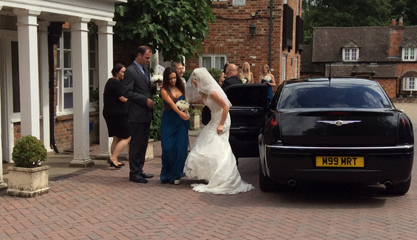 Our varied fleet can provide the bridal car, MPV’s for guests, meet guests at trainstations/airports and take to hotels/venues and if need be we can provide a fleet of cars including a Chrysler for the bride, and matching black Chrysler Grand Voyager (6 seater), Ford Tourneo (8 Seater) and Ford Galaxy (6 seater) to transfer all guests from the church to the reception. 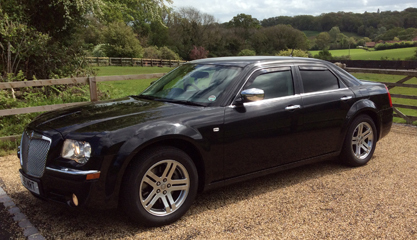 Our fantastic black Chrysler 300C with luxurious leather interior, tinted windows and sparkling front grill looks fabulous decked out with white bridal ribbons. Of course it’s fully air conditioned to ensure you arrive comfortable and relaxed and the car is only driven by it’s owner who keeps it superbly valeted to the highest degree. Of course the special day doesn’t end with the reception, when the bride and groom are ready to depart for their honeymoon Kennet & Avon cars can whisk them away to their hotel or the airport. To finish off their celebrations why not book an executive motor to meet them at the airport on their return using our Booking Form?